Hello everyone! 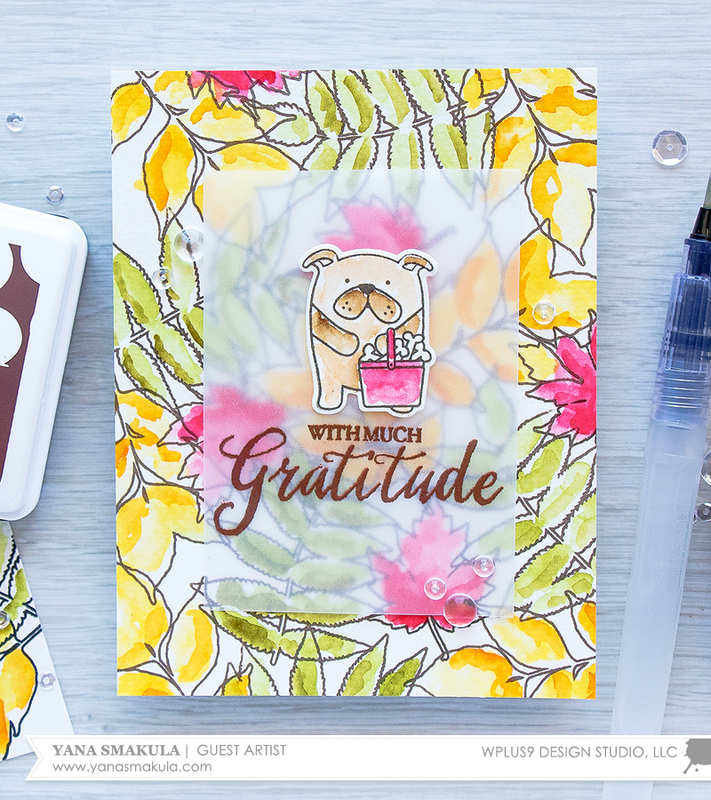 This is Yana Smakula and today I’m sharing a gratitude card featuring loose watercolor technique. I am very much addicted to watercoloring these days and I’m using it more and more to color various images for my projects. There are many different ways to watercolor and in the past, when using watercolors, I’d color my images completely and would leave no white space. Recently I discovered a new-for-me loose watercolor look that I simply adore. Even if you are not a watercolor enthusiast I think you'll find this way to watercolor very enjoyable. To create my card I started by stamping leaf outlines from the Autumn Leaves stamp set in Coconut Husk ink. I wanted a softer look with a little less contrast, so instead of using black I went with rich brown color and stamped my images onto watercolor paper. My watercolor medium of choice these days is Distress Inks and I used two colors of Distress ink for each leaf. The lighter colors were used for the base layer and than I used darker colors to add shadows. I really love how simple and beautiful my background turned out. And this watercoloring technique can be applied to a variety of different images, especially flowers. You can also use other, more traditional watercolors for this. 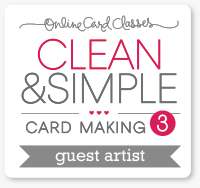 If you’d like to learn more about watercolor I highly recommend taking Dawn’s Watercolor for Cardmakers class from Online Card Classes - it will blow your mind (not to mention greatly improve your watercolor skills). After my background was dry I trimmed it down to 4 ¼ by 5 ½ inches and adhered onto an A2 top folding card base made out of white cardstock. 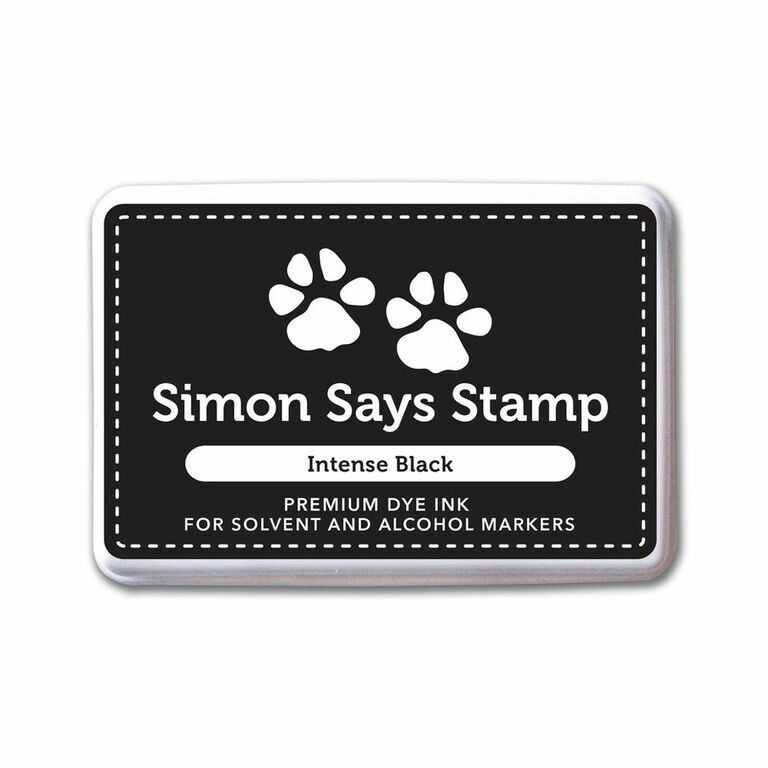 I wanted this card to have a fun and playful look so I also stamped an adorable puppy from the Friends For All Season: Summer set, watercolored him using the same technique and cut out using a coordinating die. To help my puppy stand out on the background I added a layer of vellum. It not only helped to mute a portion of the vibrant fall leaves background, but also ended up being a great place to house my sentiment. I heat embossed With Much Gratitude from the Grateful Greetings stamp set and used Copper embossing powder to try to match the color of my heat embossing to my outline image stamping. I adhered the pup onto the vellum layer and foam mounted my vellum onto the card base. Lastly I adhered several clear drops in various sizes. I love how I was able to mix images from the more traditional Autumn Leaves stamp set with a fun and playful Friends For All Seasons set to create this Thank You card. Today we are excited to have the one and only Laura Bassen joining us! I am a huge fan of Laura, not only as an artist, but as a person. She is just as lovely in person as she is online - a truly beautiful woman, inside and out. One of Laura's most notable design features is her bright cheerful colors along with her incredible ink blending techniques. 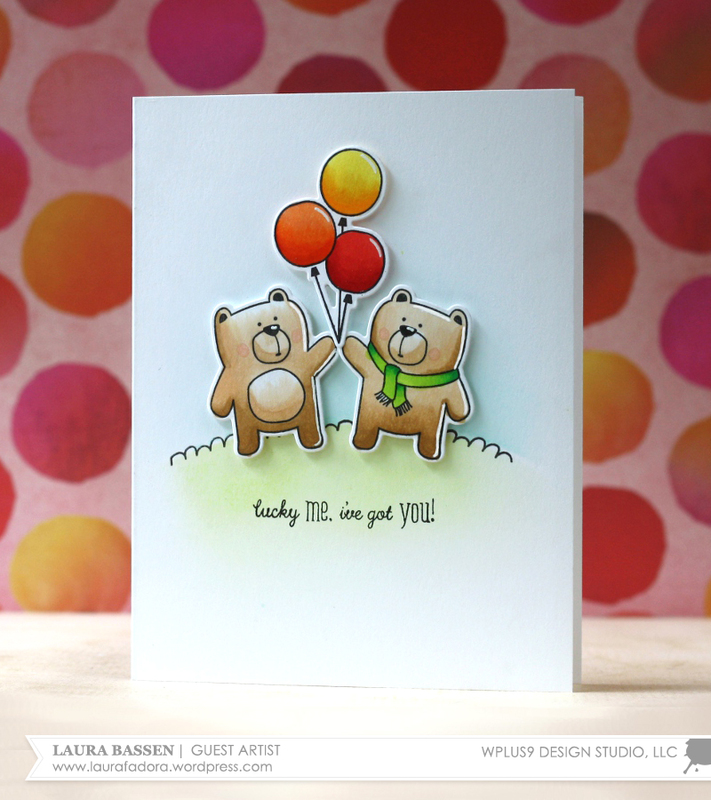 Her card designs always have an effortless charm to them and today's project is no exception. When Stephany Zerbe showed me the Friends For All Seasons series, I knew these little critters would be a perfect fit for Laura's style and she did not disappoint. In today's video she is showcasing the newest addition - Friends for all Seasons: Fall. 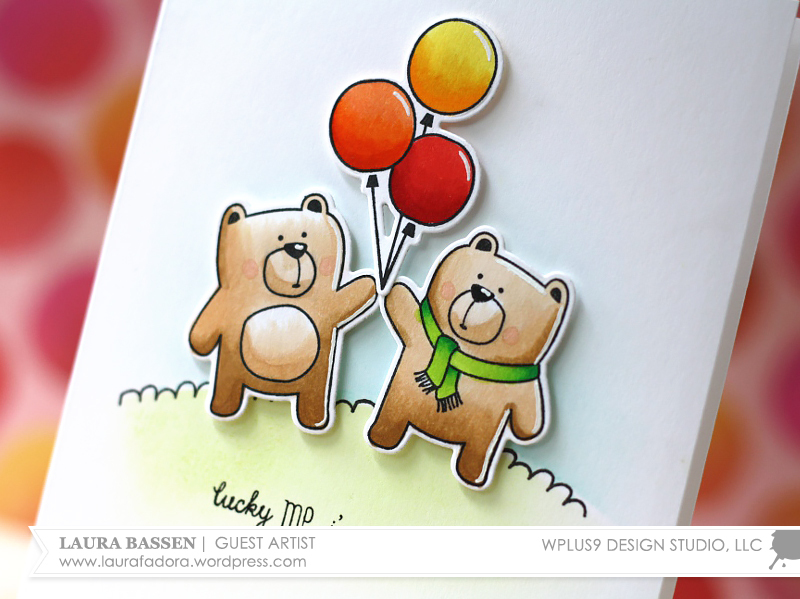 I just love the clean results Laura is able to achieve with her "no fuss" style of Copic coloring. Just goes to show - sometimes less, really is more! Please join me in thanking Laura for sharing her wonderful talent with all of us here at Wplus9! AUGUST 2016 RELEASE: Release Day!